We were here for a girls weekend! There was lots of room for the 6 of us! 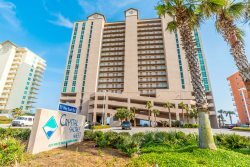 Close to restaurants and walking distance to the Flora Bama. We had a great time, and I would definitely recommend to others! My Entire Group was Suprised by it, the pictures do not do it justice! The private dock lagoon outdoors is so nice and convient if you do not feel like walking the short distance to the beach!! Just sitting on the balcony watching the views was beautiful! My group would definitely choose this place again for future vacations!!! Really enjoyed the stay, wonderful view of the bay and the pool was great. The biggest hit was the kayaks and being able to fish all day and night. Our daughters used the kayaks to set out the crab traps supplied and our sons used them to carry the fishing line out to the deeper part of the water. Everyone wants to go home and get kayaks now. Have an elderly mother we take care of and she enjoyed sitting on the back covered porch and just seeing the sights and enjoying the weather. It is close to other attractions yet quiet and peaceful at the home. Our dog just loved this place as well. We could not have asked for a more comfortable and restful stay. The owner of the house was very friendly and a gracious host. Your covered porch was our favorite part. Of course the boys enjoyed the kayaks. And my little dog was happy with the yard. I can hardly wait to come to your beautiful house again. I was shocked at the size the moment I walked in, the posted photos do not do it justice. The overall feel of the place is clean, spacious, and very homey and cozy. The beach is right across the street and there is a perfect spot on the balcony facing the water for morning coffee or evening glass of wine. My only regrets were not bringing my k-cups for the keurig and not being able to stay longer! We will definitely be back soon. Simply amazing! TONS of space. Comfortable and modern furniture. It looks a feels like a personally designed home instead of the typical manufactured hotel like condos. Everything from DVDs, books, board games, to wine glass markers, and even a Keurig . No detail has been overlooked. I will undoubtedly be back next year! We loved this place! Very spacious and close to the beach and easy access to the beach. Not far from the Hangout, which is always a fun venue, and other restaurants. Very comfortable and big with lots to do nearby! LOVED it!!! Plenty of space and all the comforts of home. Can't wait to go back. We stayed here for a last minute weekend get away. The house is very nice but the view is even better. The sunrise every morning was beautiful. We absolutely loved the kayaks, we used them everyday. The pool was clear and my husband and son even got in even though it was January. It was cold but they warmed themselves with the outdoor shower, what a wonderful perk! Another little perk was the Keurig coffee maker. I didn't know it was there before arrival but when we went to the store to stock up on food I picked up a box of k-cups. We loved being able to bring our little dog with us, thanks Keith! We had trouble with the internet, called Keith and he had it up and running in about 20 minutes...now that's service and it came with a smile! He was very nice. Something people renting should know...it is off the beaten path. We had to drive about 15 minutes to get to stores. I knew this before hand and that was part of why we chose to stay here but if you want to be right in the thick of things, this isn't it. This is perfect for the family that wants to get away but still have all the amenities; beautiful view, beach, private pool with plenty of lounge chairs and seating, fenced in back yard, large deck with more seating, hammock, kayaks, internet and QUIET! Overall a wonderful extended weekend! Wow.... Is the word that best describes this vacation home. My family and I absolutely adored this spot. The Flip Flop Repair Shop was so beautiful and nicely decorated. The pictures does not do this home justice. We loved the fact that we could bring our dog along. The view in the mornings was so peaceful and relaxing ,we hated to leave. We highly recommended this spot to anyone looking for a relaxing vacation. Thank you Keith for sharing for your beautiful home. We will definitely be coming back! We were looking for something secluded and laid back, and this home absolutely fit the bill. The location is not typical beach, but that was ok by us. The kayaks provided were worth the price of admission on their own! Rooms are perfectly laid out for families, kitchen was functional and well stocked. The porch was the hotspot of the home. There was a lot of rain as we headed down, so the pool had quite a few leaves in it, but nothing that would keep us out of the water. The dogs had a wonderful time in the yard and swimming easily in a beautiful bay. Outdoor shower with HOT WATER (a luxury in my book) was probably a highlight for bathing the dogs and rinsing off ourselves, especially in April! Didn't hurt that there was some doggie shampoo already provided. Staying during the week meant a quiet and secluded little beach next door for us. Saturday we headed across the bay to Perdido Key. Beds and furnishings were wonderfully comfortable and we really felt we had the opportunity to unplug and relax. Will definitely be back, and appreciate the opportunity to spend time together! There were pros and cons to renting this house. First, it was a well decorated, comfortable house, and in a peaceful neighborhood setting. The fenced in yard was great for our dog. Being difficult to find a place that rents with pets, I was pleasantly surprised at how nice the place was. Thanks for allowing pets! Since the weather was cool, we couldn't enjoy the pool, which looked very inviting, but did take the kayaks out a few times and enjoyed Perdido Bay. Very nice to have these available. The porch was a great place to read, have morning coffee and watch the sunrise or sunset. Plenty of room for everyone to spread out. Keith was very accommodating all along the reservation process and a pleasure to work with. Great place to kick back and relax, you feel that you are all alone as the yard has plenty of large trees lining it. It was quite a hike to drive to Orange Beach/Gulf Shores, about 20-30 minutes. The location was the downside for us as we had to all go together when heading to the Orange Beach area. This might be desirable for those looking for a place away from it all. If we didn't have the teenagers along, it would have been nice for a couple or group of couples. The place didn't really lend itself to walks on the beach, as the shoreline area is lined with homes. Maybe it was just us, but we didn't want to infringe on what appeared to be neighboring private beach property. Would we rent it again? If we went with other adults and were looking for a relaxing place away from it all, yes. Having to all go together whenever we left the house was not ideal for us, but that's just how our family rolls, we like to go off on our own sometimes and don't like to spend alot of time on the road. Thanks for everything, Keith. It's a beautiful place. very nice home! my family stayed a week and had an excellent time. our daughter brought her dog, it is very dog friendly!! !fenced in which was easier to keep up with jazebele!! !the dog and LILY our 3yr old grandaughter. loved our on pool, specially lily!!! !beds were wonderful, slept very well. the only negative for the guys was the small tv in living area. didnt like having to watch the game/or racing on it.once we figured out the area, things were accessable,i personally enjoyed the front porch/and swing. one other thing we like to cook for ourselves a lot and we didnt have a charcoal grill!!!!!! i would recommend this lovely house. MANAGER RESPONSE: Home now has a 42 inch flat screen TV and a Big Green Egg for grilling. As a frequent user of the internet to rent vacation homes, I must say Flip Flop Repair Shop is by far our favorite and we can not wait to return as we felt like we truly have been on vacation! Everything was perfect! We took advantage of the kayaks and spent some time paddling out with the dolphins, which drove our dogs crazy back on shore (they too had a blast!) We were able to purchase incredible fresh seafood and the kitchen was perfect for a few family feasts. Keith - thank you again for the hospitality of you and your staff -- you helped us create a beautiful and memorable vacation. See you soon!!! The Flip Flop Repair Shop is the best place on this whole strip. It is everything Keith said it was. Perfect for my grand kids and wrroy free for me. Our little dog loved it too. The dolphins were fun to watch and all the birds. The place is decorated beautiful. The peace and quite and private pool....WONDERFUL! Thank you for sharing this place with us. We were so excited about staying at this place. It looked awesome in the pictures and sounded perfect according to description. When we got there, we noticed we seemed to be definitely away from everything and there were lots of pine trees instead of palm trees. The neighborhood was not that impressive. In fact it was depressing looking. When you turn to go down the driveway to the house, the view is very unattractive. The house itself is nice. There was a empty lot to right of house that was like a public beach area. It wasn't really a beach though. It was small and mostly growed up with grass and trees. It was definitely not appealing. The pool was green and not in proper working order. There was sand all in bottom of pool. The water was supposedly "safe" to swim in but you couldn't see the bottom of pool. The house on the inside of descent as far as clean goes. There was dust on all ceiling fans. The return vent in ceiling was covered in dust. The dishwasher didn't work properly so dishes were not getting cleaned well. The handle came off the stove while cooking. The drain in the shower was stopped up and would fill up with water while showering. The grill didn't work. We had a snake crawling our yard. There were waterbugs on the back porch and in the house. To have paid what we did, we were disappointed. I was expecting like a community of beach houses. Well, this was far from it. We took our dogs. They seemed to have had fun but they are dogs, they would have fun anywhere. To sum it up, we will not be back and I would not recomment this place to anyone. I would maybe if had a different location on the bay where the surrounding area was prettier and cleaned up. MANAGERS RESPONSE: This was during the BP oil spill and a most difficult time. I'm not one to make excuses but with the uncertainty of the situation our community was merely trying to survive. Forced to respond to daily cancellations and a crisis environment, I failed to take care of some important details related to my business. I apologize for not provided the vacation you expected and deserved.